101 Ways to Leave a Game Show is a television show in the Game genre starring Jeff Sutphen. The tv show first appeared on air on 2011-06-21. Our users found the overall impression of this television show to be Exciting. The tv show's official site can be found at abc.go.com/shows/101-ways-to-leave-a-game-show/index. 101 Ways to Leave a Game Show is good mindless fun :). 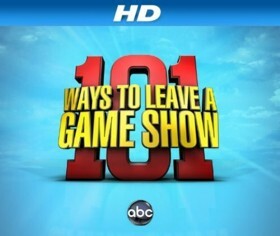 "101 Ways to Leave a Game Show" is like a cross between "Fear Factor" and Jeopardy. Each episode begins with 8 contestants separated into two groups of 4. In each of the first 4 rounds one contestant from each of the two groups is eliminated in an outrageous fashion such as being run over by a monster truck, being ejected into the air, or being sunk in a ship. Each of the initial four rounds consists of two parts: In the first part the host, Jeff Sutphen, asks the group a very general question (i.e. what percentage of hospital admissions are due to falls, how tall are the letters in the Hollywood sign, etc.) and the contestants write down their answer on a mini chalkboard. The contestant that is closest to the correct answer gets to go first in the second part of the round, the second closest contestant goes second, etc.. In the second part of the round Jeff asks the contestants a more specific question with multiple choice answers. Three of the four choices are correct and the contestant that gives the wrong answer is eliminated from the show with one of the crazy methods mentioned earlier. Eventually there are only 4 contestants remaining and they enter the final round. The final round is slightly different as only 1 of the 4 multiple choice answers are correct, but otherwise its format is the same as the earlier rounds. During the first two episodes the final round's elimination was pretty much the same, the contestants are placed on planks 100 feet above a pool of water below and if they give the wrong answer the plank drops out beneath them and they drop to the pool below. The last remaining contestant wins $50,000. Initially I thought the show was very shallow in that it didn't have a lot of content, but I find it doesn't matter too much since the show is very entertaining and it is fun to see the various ways that the contestants are eliminated. Also, the host, Jeff Sutphen, is perfect for the job. He is very funny without being too overly obnoxious. Overall, I hope that ABC picks up the show for another season - it's good mindless fun :).